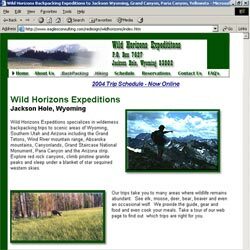 Project scope: Based in Jackson Hole, Wyoming, Wild Vistas Trekkingprovides wilderness backpacking tours to such diverse locations as Yellowstone National Park, Grand Canyon National Park, Absaroka mountains, Canyonlands, Escalante Grand Staircase National Monument, Paria Canyon and the Austrian Alps. Design components: This was a redesign of an existing site that needed a fresh new look to more accurately convey the company. The new design of all graphics and color scheme, navigation menu, and online forms for placing reservations and processing credit cards. Database Tools: We developed an on-line registration system for WHE, allowing their customers to signup for scheduled trips and create custom trips and pay by check or credit card along with administration tools to allow WHE to manage their schedule. 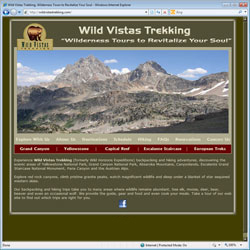 “For Wild Vistas Trekking, Vortices Design created an extremely attractive, compelling and easy to navigate website. I have found that potential customers actually enjoy the time they spend exploring the site and our web traffic has increased dramatically. More importantly, our bookings have increased dramatically. I attribute the increase in business directly to quality of the work by Vortices Design.